Dental implants act as an artificial tooth root that supports replacement crowns. The implants themselves are small, tooth root shaped, titanium posts that are surgically placed in the jawbone in the area where teeth are missing. Dental implants are incredibly durable and nearly impossible to differentiate from natural teeth. Dental implant surgery enables patients to enjoy a better quality of life. For most people that have lost a tooth or multiple teeth, dental implants can restore a beautiful smile. They are able to bite and chew food without discomfort. In most instances, patients do not notice a difference between their natural teeth and dental implants. Modern dental implant surgery has been in use for more than 30 years. 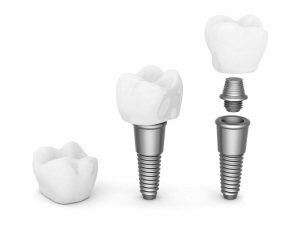 Implants are typically made with titanium which is a material that is readily accepted by the body. Titanium is exceptionally strong and serves as a stable foundation on which to mount prosthetic teeth. Restore your smile and eliminate the embarrassment of missing teeth or unsightly gaps. Be able to eat what you want and when you want. Be comfortable socializing, eating, drinking, laughing and sleeping. Regain your self-esteem and self-confidence. Unlike bridgework, there is no load placed on the remaining teeth. Long term data suggest that implants last much longer time than conventional tooth restorations, when maintained with daily brushing, flossing and regular visits to the dentist. Implants allow you to chew better and speak more clearly over other replacement methods. This is a surgical procedure and there will be a period of discomfort and healing. May be more costly than dentures or bridgework. If something happens to your natural teeth, Phoenix dental implant expert, Dr. Reem Kidess, DDS will help you to live confidently again with dental implants. Dr. Reem Kidess approaches each patient from a unique and highly personalized perspective. Each client will be provided a multitude of options, with Dr. Kidess walking you through how each one can meet your dental implant needs. With almost two decade’s worth of experience, Dr. Kidess can ensure that your smile is beautiful and functional again.